including our Youtube Video and Half Marathon Review. I love roller coasters. I love running races. Like peanut butter and jelly, putting the two together just makes sense! Or…hot and the cold are both so intense, Put ’em together it just makes sense!..yeah, ok, sorry, couldn’t resist channeling my inner Olaf on that one. Earlier this summer, my girlfriend Candace and I ran the Cedar Point Half Marathon, which is a part of the Run and Ride Race Series at amusement parks around the country. 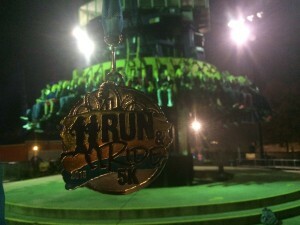 This year they added Kings Island to their roster of races, offering 5k, 10k, and half marathon events. 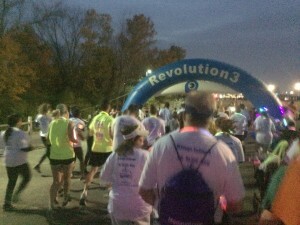 The added bonus is that this 5k would be my first glow race. 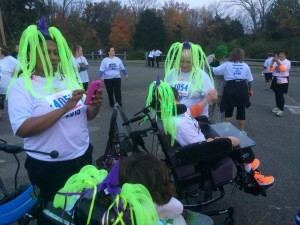 So, we loaded up on glow sticks and got set to run…and ride! Getting to this race could not have been easier. We booked a hotel for the weekend and, given the timing of the race for the evening, were able to check in, and have plenty of time to get to the park for bib pickup. There was no expo for this event, only a quick and easy bib pickup with a small merch tent. All 5k bibs had to be picked up on race day, which was fine by us. This process was fast and easy and they let us pick up our half marathon bibs at the same time. Essentially, they could not have made this process easier for us, which was much appreciated. Organizers did a solid job of loading us up on race premiums. Entry to the 5k got you a short sleeve tech shirt (they are white, which is my least favorite color as I am informed that I spill stuff on white, no bueno). Beyond that, we also received entry into Kings Island’s Halloween Haunt, which is their version of a nighttime seasonal party with haunted trails, seasonal decorations, and lots of college kids in makeup trying to scare you. This also gave you access to all of the great roller coasters – at night! As 5ks go, this is a solid offering of swag. Very nice indeed. Nothing else I wore really matters except for this: Candace took the lead and loaded us up with glow sticks…lots and lots of glow sticks. She fashioned a necklace for me and I wore 2 on each wrist for a total of 6. She wore 5 on each wrist, plus a necklace, headband, and a light up tutu. Not only was her outfit a fan favorite, but it helped a lot in lighting up the course for us. After we picked up our packets we moved the car so it would be closer to the main park gate, and then walked to the far corner of the parking lot where the race would begin. Once there they checked our park tickets and stamped our hands. There were a few port-a-potties (sufficient for the crowd that was there) and dance party with a DJ. Dance parties are not really my thing, but this was a big hit with the tween and younger kid crowd, and people went crazy for the free towels and glow sticks that the DJ threw into the crowd. The race used a mass start, which was perfectly adequate for the size of the field. We started at one end of the Kings Island parking lot and made our way towards the park entrance. As Halloween party guests were arriving for the night, all they needed to do was stay outside of the running course, but yeah, this was too difficult of a concept for one man and his teenage sons. (We all know that I have a rather unfortunate history of park guests who think they can enter race courses). They decided that they just HAD to get through the course and so they ran onto the course to cross, which was not only ridiculous, but also very unsafe as they stepped right in front of the faster runners toward the front of the pack. The catch was, the course took an immediate left turn, which trapped this course jumpers, who then had to wait for the entire field to pass before they could enter the park. Yes, there was some serious schadenfreude amongst those runners in our immediate area at this realization. After the turn we made our way into the backstage area of the amusement park, where we would run along access roads. This is a good point to make this observation. This 5k course was surprisingly hilly, including some rather steep (though not necessarily long) inclines and declines. As a result, runners will either love or hate this course. Candace was solidly in the camp of dislike for this course, because, as she put it, no 5k should be this tough, 5ks should be fun, and carefree. Conversely, even though I am not the biggest fan of hills, I loved this course. Perhaps it was running it at night or perhaps it was because I knew, that running 3.1 miles over hills is easier than running 13.1 miles of hills. Regardless, don’t see this course as one where you should go into it untrained. But, it can be a lot of fun. The most compelling aspect of this course was running below and along the various roller coasters. The access road proceeded along the footings for the major coaster attractions in the park. Parts of this course were a little on the dark side, but the glow sticks certainly helped to light our way and make sure we were on solid footing, so I would definitely recommend bringing some if you run this race. 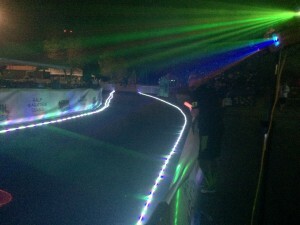 At various points throughout the course organizers placed some light roping and lighting effects. These were very cool and the race could only benefit from a greater presence of these effects throughout the course. The course even wound through the animated dinosaur exhibit, which were active during our run, making for a unique running experience. After a couple more hill descents and climbs we found our way into the Soak City water park, which was closed for the season but made for a nice finish area. As we made our way around the lazy river, the irony of running on the concrete areas of a water park was not lost on us. One final turn and we saw the inflatable finish line archway, lit up with more lighting effects. And with that, we made one final push to the finish. As 5k medals go, this is a very nice one. It is a good quality, heavy medal. It does lose some points as it is affixed to a plain blue lanyard with one of those clips that I am on the record as not liking. There really was not much fanfare to this finish area. As I approached the finish, I happened to see some drinking cups set out in one of the concession stands, which led me to turn left to go grab a drink – I was really thirsty. Otherwise, I may have missed it entirely. After we were done rehydrating, we did hear the announcer directing runners to where the drinks were set up, but there were no signs otherwise directing runners and the drinks were in kind of a funky location relative to the finish line. Other than that, we had a long walk back through the water park and into the main amusement park itself so we could make our way back to the car to change our shirts before returning for the Halloween festivities the rest of the evening. OK, I know that this was not a runDisney race, but as I am not the biggest Halloween fan, I do not have the biggest selection of Halloween music on my IPhone. So I decided to go with 2 long pieces of seasonal Disney music, Halloween Wishes and the Boo to You Parade from Mickey’s Not So Scary Halloween Party. Both songs were perfect for a night race with a heavy dose of Halloween on a cool autumn night. 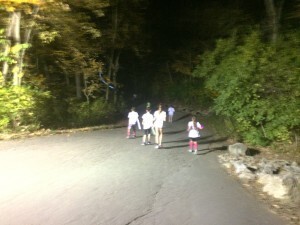 After this race I am definitely interested in running more nighttime/glow races in the future. It was a lot of fun and a different twist on the race day experience. Add to this entry to the nighttime Halloween party at Kings Island and you have the makings of a fun autumn race event. As this is still a relatively new event, I am excited to see what additions organizers will have to this event going forward. However, while I did enjoy this race, I must caution that this is one of the more challenging 5k courses you may encounter given the steep declines and inclines along the way. Even if you choose to walk the course instead of run it, some of the inclines will present a significant challenge if you are not properly trained. Regardless of your race plan, be careful to watch your footing and bring some glow sticks to help light your way. Other than that, enjoy your run and have a scary good time! Neither Mike nor Casual Runner received any compensation for this review. The entry for the race reviewed herein was provided by the event organizer for purposes of this review and the opinions are solely those of the author.